Asam lota, Rabon lota (mikania micrantha, family: asteraceae) is a perennial extensive wild creeper. It can be easily found in fallow lands, crop fields and roadside areas in Bangladesh. Leaves are opposite, green, ovate to cordate, edge sometimes uneven, sometimes wavy, petiole long, sometimes dark green, sometimes pale. The size of the vine or its leaves differ on the basis of soil fertility. Branched inflorescence comes out from leaf axil. Flower is white or pale white. Each branch contains three to four white flowers. Numerous branches occurs together. Therefore, the flower cluster seems quite large. It is a invasive species. Usually with the help of a tree it climbed up. In case of small tree it does serious damage. It spreads quickly in rainy season. So it causes serious damage to crops then. Especially it does a great damage to Shal forest and Tea plantation. Although it is quite effective to prevent soil erosion. Chatim or Devil's tree (alstonia scholaris, family: apocynaceae) is a much branched tall tree. The evergreen tree gets a height of 15-20 m. Its trunk is dark grey, slightly rough. The good looking tree is found in South and Southeast Asia. Flowers are greenish white, occurs in a large cluster, extreme scented. For this its presence is felt from afar at night. This is one of the main features of the tree. Leaves are narrow, obovate, 10-18 cm long and 4-5 cm wide; shiny above, pale beneath. Leaf breaks if you fold. The canopy spreads like an umbrella. Wood is white and soft. Leaves, branch, trunk─overall whole tree contains milky latex. In Sanskrit, it is called Shopto-porni (seven-leaved tree). Though a rachis holds 4-7 plates usually, sometimes 8. It blooms in late Autumn (Sep-Oct). Fruits are light green, slender, cylindrical, 20-50 cm long. Ripe fruits burst. They remain on tree like this for a long time. Its propagation is caused by seeds. Kamini (murraya paniculata, family: rutaceae) is an evergreen small tree or large woody shrub that can get a height of 3 m. Its grey trunk is small. The leafy ornamental plant is native to China and Malaysia. Flowers are showy, pure white, strongly scented, Petals 5, each divided, curved; base is narrow, broad at the end. Kamini is one of the most vital flowering shrubs for a elegant garden. Its regal blooming, great scent and holy color is incomparable to plant kingdom. The fruit is a berry, round, orange-red in color. They are edible to human. The beautiful leaves are used to beautify the bouquet. Kaash (saccharum spontaneum, family: poaceae) is a perennial grass can be seen along the edge of rivers and canals. It can get a height of 5-6 m. Its trunk is straight, hard and long. Kaash is native to Indian subcontinent. For decades Kaas has beeen used as an Ayurvedic medicine in different kinds of diseases in this area. Flowering time is autumn (Sep-Oct). Bangla literature is inspired by this beautiful and incomparable flower. Autumn means Kaash─we, Bengalees believe that. When autumn comes, Bengalees became crazy for this flower! Kaash spreads like a vast empire! Stem is cylindrical, fistular. Leaves are tall and slender, alternate. Buffalo prefers this grass. Thick ropes are made from stem scale.Propagation is caused by divisions. Country's one of the paper mills was based on this grass. It is used in jaundice. It is pretty effective to prevent soil erosion. Rokto-komol or Red Water Lily is a very common perennial plant of water bodies in Bangladesh. In fact the aquatic plant is native to Indian subcontinent. It is is found in canals and ponds, overall in the waveless waters. Flowers are showy, reddish. Fully bloomed flower is 15 cm broad. Floating or little raised leaves are big, almost round-ovate, 18-40 cm broad, edge is serrated. Leaves are so big that a waterbird can walk easily on them. The flower bud of Rokto-komol is not less beautiful than the full blooming flowers. Flowers are slightly scented. Fruits are edible, they have numerous seeds. Subcontinental people eat the peduncles as a vegetable also. Very long reddish peduncles are smooth, juicy. Red Water Lily is planted as ornamental plant in indoor aquariums. Propagation is caused by seeds. It can also reproduce by seedlings. Closed bud, during the day. Ulotkombol, abroma augustum (family: sterculiaceae) is a shrub that can reach a height up to 5 m. Entire plant is hairy. It is very remarkable about this plant that its flowers are basipetal bur fruits are positioned upward!The beautiful plant is evergreen. It can be easily kept as an ornamental shrub in tropical gardens. In Bangladesh it is found in fallow land. The plant is one of the most favourite medicinal plants in Indian subcontinent. Common names: Ulot-kombol, Cotton Abroma. Flowers are deep megenta. Petals 5. Flowers bloom in July-September. Leaves are simple, long petioled, about 20 cm long; cordate or broadly ovate, pointed at the end; 10-15 cm long and 10-12 cm broad. Fruits are 5-angled. The juvenile fruits are attractive green in color. A fruit holds many many seeds.Propagation of the plant is caused by seeds. Flower in full bloom 5 cm across. The fruits of Ulotkombol ripe in October-January. Easter Lily Vine, Nepal Trumpet Flower, Beaumontia grandiflora (family: apocynaceae) is alarge and stout climber found in the hilly areas of Bangladesh, specially in the forest of Sylhet. This beautiful woody climber is one of the rarest ornamental climbers of the country. The evergreen species is also native to Indian Subcontinent. Common names : Easter Lily Vine, Nepal Trumpet Flower. Leaves are opposite, dark green, pale beneath; obovoid, pointed at the end; big, 6-10 inch long, veins clearly visible. Young shoots are pinkish and hairy. Funnel-shaped fragrant white flowers are large, 12 cm long and 8 cm broad. Petals 5. In broad daylight flowers dry quickly. Blooming season is spring. The propagation of the climber is caused by cuttings. Kathali-chapa, artabotrys hexapetalus (family : annonaceae) is a bushy shrub, native to South and Southeast Asia. Its stem is woody. Immatured flowers are whitish green, matured are deep yellow in color; petals 6, leathery, open. Calyx is curved, like a hook. Leaves are alternate, shiny green, oblong-lanceolate, 5-14 cm long, 2-5 cm wide. Propagation is caused by cutting and seed. Group of fruits (usually 6) grow together at the end of long peduncle. Fruits are ovoid, smooth, pointed at the end, 2.5-4 cm long. Flowers are well scented. They scented like ripe Jackfruit. In Bangla, the flower is named after this reason. Flower blooms from summer to rainy season. Trumpet vine (campsis grandiflora, family: bignoniaceae) is one of the most beautiful flowering climbers in the world. The woody deciduous climber from tropical America is very very favourite to amateur gardeners of the tropical world. Leaves are opposite, deep green, pinnate. Leaflet 7-9, terminal one present, dented, 3-5 cm long, veins are clearly visible. 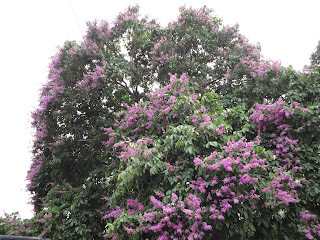 It blooms profusely from the summer to rainy season. The flowers can be seen easily by its gorgeous big showy clusters. Flowers are big in size, orange-colored, funnel-shaped; petals 5. A blooming flower is 4-5 cm across. Propagation of the plant is caused by cutting or sucker. It is grown as ornamental plant in Bangladesh. It can be seen in parks and roadside areas. The vine itself a attractive one. Although Olokanonda or Allamanda (allamanda cathartica, family: apocynaceae) looks like a vine but it is clearly a shrub. The semi woody stem is slender. It's original home is Brazil. The flowering shrub's branches are narrow. Four leaves arise from each node. Flowers bloom in plenty during the summer and it continues till the rainy season. Vivid yellow and funnel-shaped flowers are 5-lobed. The attractive flower, though scentless, is very favourite to the amateur gardeners throughout the tropical world. Leaves are lanceolate, tip acute, 7-11 cm long & 3-5 cm broad; midrib hairy. The beauty of color contrast! Elegant flowers are very showy. Propagation of the beautiful shrub is caused by cuttings. The vine-like shrub can grow well under the open sun. If you expect more flowers from your plant then trim it after each bloom. Oporajita or Butterfly pea (clitoria ternatea, fabaceae) is an annual twiming climber. It is native to tropical Asia and found throughout the tropical world. The flower look like women's genitalia. The genus name 'clitoria' and Sanskrit name 'Jonipushpi' are mentioned for this reason. Common names: Oporajita, Asian pigeonwings, Butterfly pea. Flowers are butterfly-shaped, blue, light blue or pure white. Leaves are pinnately compound, leaflets 5 or sometimes 7 per pinnae; leaflets ovate, alternate, the terminal one is largest. Flower blooms throughout the year. Fruit is a legume, 4-7 cm long and about 1 cm wide. Propagation is caused by seeds. Root, bark and leaves are used to prepare medicines for pain, goitre, diabetes, bronchial and skin diseases. Root is used for defusing the affect of snake's poison and for smooth delivery of baby. The flower is popularly known as butterfly. Modhu-monjori or Rangoon creeper (combretum indicum, family: combretaceae) is a extensive woody perennial creeper with red flower clusters. The ornamental vine is native to South and Southeast Asia, specially to Indian subcontinent and Myanmar. The woody climber can reach a length up to 8 m.
Common names: Modhu-monjori, Madhuri-lota, Rangoon creeper, Chinese honeysuckle. Flowers are originally red, slightly scented, corolla tubular, petals 5. Flowers bloom mainly in summer and rains. Leaves are green, rough, opposite, ovate, apex acuminate, edge wavy, 6-14 cm long and 3-6 cm wide. With the change of time the white flower becomes pink and then it turns red. Fruits are elliptical, 5-winged, dark brown in color. The Bangla name of the flower (Modhu-monjori, madhuri-lota) is named by Rabindranath Tagore. Lota futki or Balloon plant (cardiospermum halicacabum, family: sapindaceae) a large creeper with wiry stems, climbing other trees with tendrils, sometimes completely covering the host. The climber is native to tropical and subtropical Africa and Asia. Fruits are 3-seeded. Each seed have a heart-shaped mark at the top. Common names: Lota futki, Balloon plant, Balloon vine, Love in a puff. Flowering and budding occurs round the year. Flowers are very small, greenish white. The plant grows on fallow land as weed in Bangladesh. It is used in rheumatism, constipation, urinary and menstrual disorder. Leaves are compound, ternate, lanceolate, lobed or serrated, 4-8 cm long. Fruit is triangular, 1.5-4 cm wide, hairy and black when ripe. Calyx develop into the coat of fruit. Kanchira or Bengal dayflower (commelina benghalensis, family: commelinaceae) is an annual herb with swollen nodes. It is native to tropical Asia and Africa. Common names: Kanchira, Bengal dayflower, Tropical spiderwort. Leaves are green, alternate, simple, 10-15 cm long, with prominent sheath. Inflorescence arises from the axil of a foliage leaf. Flower is blue, small, sepals 3, petals 3. It blooms in August-September. Propagation of the plant is caused by seeds. It grows as a weed on fallow land in Bangladesh. Its juice is applied as antiseptic on cut or burning injury. Root is used in headache, fever and leprosy. Knot of stem is used to prevent sterility. Nil bonolota or Bengal trumpet (thunbergia grandiflora, family: acanthaceae) is a vigorous perennial climber. The climber is native to Indian subcontinent as well as Southeast Asia. Common names: Nil lota, Nil bonolota, Bengal clock vine, Bengal trumpet, Blue thunbergia. Flowers are big, pale blue, on pendulous racemes. Sepals 5, petals 5. Leaves are angularly cordate and lobed, rough on both surfaces, 10-16 cm long. It continuously produces flowers in summer through rainy season. It is grown on fence, pergola or wall in Bangladesh. Root of the plant counteracts poison of snake. Leaf juice is stomachic. Propagation of the plant is caused by cuttings.